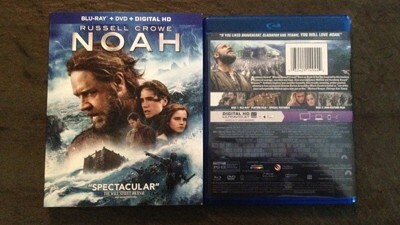 Noah delivers quite a miraculous audiovisual package on Blu-ray, hallmarked by an absolutely breath-snatching 1.85:1-framed, 1080p AVC transfer. Having seen the film theatrically, I honestly couldn't have asked for more here: the Icelandic landscapes present vibrant greens and challenging deep-grays and blacks; plays on the setting and rising sun project inspiring gradients from deep blue to a low-radiance orange; and the weathered wood of the ark looks fantastic either in the story grays of rainfall or in the low lighting inside the ark itself. Close-ups on Russell Crowe's bearded mug showcase effortless textures in his windswept skin, facial hair, and makeshift apocalyptic clothing, whether he's framed by the crystal-clear stars of a skyline or the fluently-rendered raindrops beginning the flood. The digital effects are magnificently tight -- from the warm yellow glow and gnarled stone of the Watchers to the scales, hair follicles, and flapping wings of birds -- while contrast levels are incredibly deep yet courteous to the details looming within. The stunning and moody landscapes, the potent visuals, and pitch-perfect rendering of it all form this into a demo-worthy visual treat on Blu-ray. The 7.1 DTS-HD Master Audio track is its own force of nature, thunderous and dynamic during its many scenes of bombast and intricately nuanced in its personal moments. 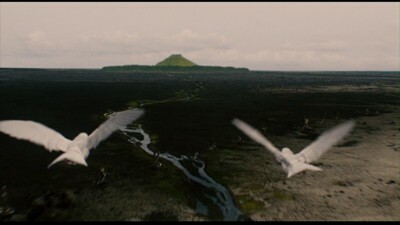 Clint Mansell's score frequently drives the film with hefty activity from all channels, yet it never overbears the environmental effects, allowing sounds like the rustling of leaves in the forest, a rushing stream, and the swirling flaps of wings and chirps from a cloud of birds to organically resonate alongside it. Minuscule sound elements, like the plucking of a small flower and the scraping of moss into a pipe in our introduction to Noah, are incredibly crisp and convincing in their natural higher-pitched presence, while the grinding rumble of the Watchers' stony movement command a full yet innate usage of atmospheric bass. Dialogue is, in a word, impeccable in its escalation in tones and intimacy, never distorting and always credibly natural. Yet when the film escalates towards the intensity of the flood itself -- torrents of water, a rush of battle-ready men, massive claps of thunder, and the creaking of the ark in the waves -- it takes the activity on a grandiloquent ride with chest-rattling potency. Modern sound designs don't get much better than this. Subtitles and alternate-language 5.1 Dolby Digital tracks are available in English, French, Spanish, and Portuguese. Opening up the extras tab on the Blu-ray might seem a little disappointing at first, revealing a collection of only three features focused on Iceland at a shooting location and the Ark's interior and exterior. 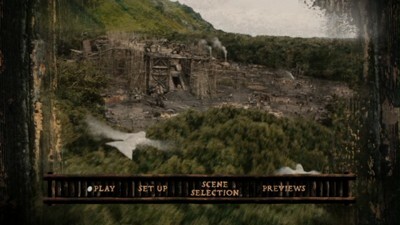 However, when you hit the "Play All" button through Paramount's infrastructure, it's revealed that these are actually three segments in a rather lengthy exploration of the making of the film, artfully shot and edited by Niko Tavernise, responsible for nearly the same thing with Black Swan: Metamorphosis. Once again, this feature pieces together traditional elements one might find in a studio-produced arrangement of featurettes -- cutaway interviews to the filmmakers, behind-the-scenes glimpses at production and makeup, comparisons to conceptual art -- yet it does so in a methodical and far more expository fashion, cozy and casually revealing in the way it glimpses at Aronofsky and the process of achieving his scenes. With each segment forwarded by a verse from the Bible and accompanied by absorbing yet unobtrusive music, the three pieces makes you appreciate the scale and the effort of the filmmaking; however, they don't hit you over the head with 'em, instead letting the viewer become an invited observer. Iceland: Extreme Beauty (20:40, 16x9 HD) explores the exquisiteness of the landscape, sure, but it also unceremoniously reveals the complexities behind filming in the location: airlifting supplies and relishing the area's elf lore, the erratic nature of weather and cloud patterns for capturing specific types of light, and reaching tricky shooting locations. The Ark Exterior: A Battle for 300 Cubits (19:46, 16x9 HD) transitions to the New York shooting location for the mammoth vessel erected for the film, highlighting the usage of a large, nondescript field for the erection of an ark with somewhat accurate dimensions. 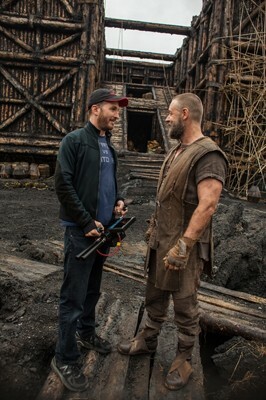 It also, however, offers a unique glimpse into Aronofsky's passion behind the project, where he tells the story of his fascination with "Noah's Ark" as a narrative and the skewed planning time vs. shooting opportunity nature of the beast. The Ark Interior: Animals Two By Two (19:55, 16x9 HD) offers a hard look -- both inside and outside -- at the stage utilized for the massive wooden interior, with a time-progression shot of the engineering work put into building the thing. Subtle comparisons to visual effects and raw footage to the final scenes work their way in here, with some really clever point-of-view and angled glimpses at the movie-making magic (there's a great shot here of a rising platform and tracking of Crowe's movement). Disc Two is a bare-bones DVD presentation of the film, and the Blu-ray also comes with an Ultraviolet Digital Download slip. 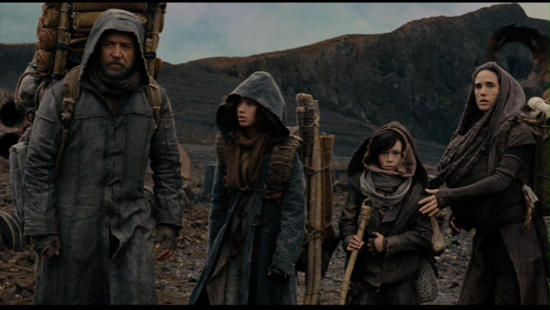 Like many other adaptations (be it historical or fiction) over the years, Darren Aronofsky takes liberties in his vision for Noah, using the sparse infrastructure supplied by scripture to tell a tale of humanity's corrupt reach, the judgment of their Creator, and the man tasked with preserving life during the cleansing apocalypse through outlandish means. I applaud the director's ability to be faithful to the story's intentions as he evokes a novel fantasy-inspired setting for the events, while constructing a parable out of its cautionary musings about the merits and downfalls of mankind and the obscured, interpretive nature of belief in higher powers. 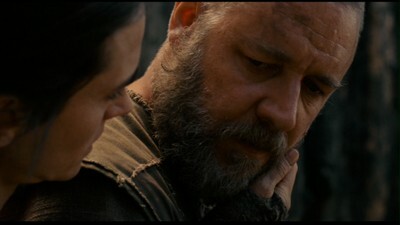 Aronofsky's darkly poetic and poignant perspective stands at the core of the film, while a gradient of strong performances -- including an understandably burdened and frustrated Noah through Russell Crowe's fitting intensity -- interweave within the story's thematic buildup, the cataclysmic blockbuster arrival of the flood, and the wash of introspective conflict and devout interpretation in its wake. The stark boldness won't be to everyone's tastes, and it's certainly not perfect, but I found the journey and destination of it all quite absorbing. Paramount's Blu-ray looks and sounds utterly phenomenal, and the one-hour segmented documentary is well worth the time. Strongly Recommended considering its polarizing nature, even though the temptation to give it a higher stamp of approval is there.